I have written before about being a lucky person, in particular, about being a person whose flights are always on time. But on my trip to Oregon back in November, I had a seriously delayed flight (mechanical difficulties), which forced me to cancel a class and spend the night at an airplane hotel in Salt Lake City. And on my trip to New Orleans this past weekend, I had serious delays in BOTH directions. Going, my original flight was canceled from an ice storm, and the rebooked flight was delayed for other weather-related reasons, so I got to New Orleans five hours later than initially planned. Returning home, my flight to DC to connect to my flight to Indy was three hours late (also for weather-related reasons), so I missed my connection and had to spend the night at my own expense at an airport hotel by Dulles. Is my luck changing? Am I no longer the lucky lass I have boasted of being? Certainly not! I admit that it is now no longer true that my flights are never delayed. And upon further reflection, the on-timeness of my previous flights was probably not best explained by appeal to any particular fact about me. After all, Epictetus points out that Zeus has not made us controller of the winds, but Aeolus. So here is what remains true. No matter how long the lines at security (and mine are luckily always short! ), or how irritating the delays (such as spending TWENTY MINUTES on hold waiting to talk to a United Airlines representative to change my flight yesterday), air travel is still so much faster than anything that 99 percent of people throughout the history of the world could even imagine. It is SOOO much faster than the covered wagon! And flight delays are indisputably a First World problem. One of my Facebook friends posted a link to this video where Third World people recite First World complaints taken from Twitter feeds. My favorite is "I hate it when I say no pickles and they give me pickles." As I was moaning about my long wait with United Airlines yesterday, it was hard not to imagine what that grievance would sound like repeated by someone in Haiti or the Sudan. This morning at Dulles Airport, the man ahead of me in line at Dunkin' Donuts ordered three glazed donuts and a Diet Coke (yes!) and staggered back overcome with mingled misery and rage when he learned that Dunkin' Donuts did not happen to sell Diet Coke. "You're kidding!" he accused the guy at the register, who was then nice enough to suggest that Diet Coke could be purchased at the next stand, about eight feet away. "Well, I'll certainly have to get it somewhere else!" the irate customer snapped. Yes, Mr. First World Man, it's irritating when you have to walk eight more feet and spend an extra thirty seconds to buy your Diet coke. It's irritating when you say, "No pickles," and get pickles anyway. But a life with a few unwanted pickles - or flight delays - can still be an extraordinarily lucky one. I'm lucky that I got to fly to New Orleans and spend a weekend wandering past the verandahs and shuttered windows of the French Quarter, catching up with old friends, and eating lots of bread pudding. And I'm lucky that I could take a few small adjustments to my plans in stride (helped by that timely reminder about First World versus Third World complaints, and by the tragicomic spectacle of the man ahead of me in line at Dunkin' Donuts). So am I still lucky? You bet I am. I leave in a few minutes to go to the airport to fly to New Orleans for the Central Division meeting for the American Philosophical Association (APA). My APA duties this time are minimal: to provide ten minutes of prepared comments on a paper entitled "Are children persons?" (Spoiler: the answer is yes). So to deliver ten minutes of my thoughts in this professional forum, I'm flying off to spend the weekend in this fascinating city I've never visited before. I couldn't face staying at the Hilton, the official hotel for the conference, so I found a guest house in the French Quarter, and I'll walk back and forth, or catch a cab if I need to. The session at which I'm presenting is on Saturday afternoon. I might go to some other APA sessions, or I might not. I have dates lined up with beloved former grad students and a dear friend's daughter for dinner tonight, breakfast tomorrow, lunch tomorrow, and a museum date on Sunday - for the New Orleans Historic Voodoo Museum. I also have lots of delicious work projects tucked into my backpack, should I find a tempting cafe for work and beignets. And I can stroll around charming neighborhoods and listen to some jazz, though I like jazz vastly better if it's performed by my son Gregory. Work and beignets sounds like the way to go on this one. Yesterday I faced a task on which I've been procrastinating for a few weeks: beginning to send editorial comments on the submissions for the volume on Ethics and Children's Literature that I'm editing as a follow-on to the symposium I hosted on that topic here at DePauw last fall. The contributors' expanded and revised papers were due to me January 31; I set myself the deadline of responding to them by March 15, so I'm not behind on that deadline yet, but I've definitely been dragging my feet on it, for two reasons. First, I knew I needed to use the Track Changes feature on Microsoft Word, and I have an unreasoned terror of Track Changes, a subset of my terror of technology generally. Second, although I had already read the first papers that came to me, and knew exactly what I wanted to say to their authors, I kept second-guessing myself about my comments. Had I missed something? Was I too locked into one narrow critical perspective? Was I being too critical? Or not critical enough? Should I read each paper another time? Or two more times? Or three? So yesterday, I just made myself do the first and easiest paper. Track Changes was a piece of cake! A piece of cake with nice thick frosting on it! And then, exhilarated with relief, I finished another three. And regarding my self-doubts about my comments: basically, I am who I am, and I think what I think. It might be nice to be smarter - it would definitely be nice to be smarter - but I don't see that happening in any dramatic way over the course of the next three weeks. If I read the papers another time, or ten more times, I might find one more small insight to add. Or I might not. It's exceedingly unlikely that I'd find a big insight to add. Once again, I have had occasion to realize my own variation on the famous 80-20 rule of time management: that 80 percent of the benefit comes from 20 percent of the work, and in order to get the additional 20 percent of benefit, you'd have to increase your amount of work five-fold - not worth it! My variant on this is realizing that you aren't going to get to 100 percent in any case. If I had worked harder on these editorial comments, I wouldn't have gone from 80 percent to 100 percent. I would have gone from 80 percent to 82 percent. Not worth it! It is so much better to get 80 percent in a timely way, without undue life stress, than to take forever, half-killing oneself with fear and dread, to get 82 percent. Which I proved to myself, once again, yesterday. I've been back in Colorado for the weekend because my younger son, Gregory, had his junior recital as a jazz saxophonist in the College of Music at the University of Colorado at Boulder. He and his classmate/friend Adam Gang shared an hour of original compositions by each of them plus arrangements of several jazz classics. So of course I flew back from Indiana to be there for this shining hour and to celebrate his accomplishment with him and the rest of our family. I remember the day he fell in love with the saxophone, when my husband took both of our boys, who were then in third grade and sixth grade, to the end-of-year jazz band concert at Fairview High School. That was it for Gregory. He wanted to play the saxophone. I rented him an instrument and found him a teacher and went with him to his first lesson. His teacher was a great one for pithy wisdom. I asked him how much he'd like for Gregory to practice each day. Dave shrugged. "He can practice however much he wants. But the one who practices the most wins." And he warned Gregory that it might not sound terrific at first: "If it were easy, everyone would be doing it." Gregory practiced. He was the one who did it, even when it wasn't easy. He started writing his own compositions. He played in band at school, and in our church jazz band JO3:16. He became an active participant in the fabulous Colorado Conservatory for the Jazz Arts (CCJA), which draws motivated middle school and high school students from all over the Denver Metro area to play together under the mentorship of jazz professors from University of Denver and University of Colorado. I don't know how many times I drove him down to Denver for CCJA sessions, and for concerts at the jazz club Dazzle, and elsewhere. And on Sunday afternoon he stood on the stage in the small chamber music hall at CU and played his junior recital, as I sat listening with tears in my eyes. I don't know if Gregory will end up pursuing a career as a professional musician. In addition to the Bachelor of Music degree he's pursuing in the College of Music, he's also pursuing a Bachelor of Science degree in computer science in the College of Engineering. But, hey, I've had a great life working in two careers, as both a philosophy professor and a children's book author. All I know is that Sunday was a proud and happy day. 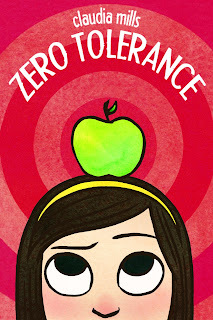 Review copies have been sent out for my forthcoming middle-grade novel Zero Tolerance (pub date June 18), and so I'm on tenterhooks waiting for any response from the universe to this novel that is so dear to my heart. I haven't yet heard anything from Booklist, School Library Journal, or Kirkus, but I did get the very first review yesterday, from Ms. Hirt's fifth-grade class at Tzouanakis Intermediate School. I have been spending one sweet morning a month with this class as a writer-in-residence, doing some writing exercises with them occasionally or just talking with these enormously bright and motivated students about the writing life. When I showed them the cover and shared a bit of the storyline with them last December, they gratified my author's heart enormously by protesting that they couldn't possibly wait till June to read it. So I left my one advanced reading copy with Ms. Hirt to use for a classroom read aloud. I told them that they were the first children in the entire world to be reading the book. When I came to the class yesterday for my monthly visit, they had just one chapter left, and I was privileged to be the one to read it to them. And then I asked them for their review. "Suspenseful and amazing," they decided. Hooray! Now, I mentioned that these children are enormously bright and motivated. Example: when I told them about a plot point from an earlier draft that didn't make it into the final version of the book, where Sierra sends a fake love letter purporting to be from one character to another, one boy asked, "Was that inspired by what happens to Malvolio in Twelfth Night?" I kid you not! One girl asked how the whole trajectory of Sierra's story would have been different if one crucial incident hadn't occurred, and the class leaped into lively discussion in reply. They offered both serious and humorous ideas for a sequel. So, I don't need to wait any longer for pronouncements from Publishers Weekly or Horn Book. Ms. Hirt's class has spoken! "Suspenseful and amazing." Yes! My sister was supposed to come visit last weekend for a delicious, delightful sister getaway. She had a week-long business trip in Indianapolis for her job with Lilly and was going to come two days early so that we could play, play, play. I booked us a room at the West Baden Springs resort, which is on my must-see-before-I-leave-Indiana list. I had a lovely itinerary planned out for us: Bloomington, the T.C. Steele historic site (House of the Singing Winds), an architectural tour of Columbus, Indiana (named the sixth most architecturally significant city in the U.S.) and more. Then the East Coast was hit by a major snowstorm. By Thursday night, Cheryl's Saturday morning flight had already been preemptively canceled. The soonest she could arrive would be Sunday mid-day. I called West Baden Springs and canceled our reservation. We both felt very very sad. But do you know what? Plan B turned out to be delicious and delightful, too. Cheryl had a cozy, comfy Saturday in New Jersey with her husband and her many (MANY!) teddy bears, looking out at the falling snow. I had a stress-reducing productive Saturday reading the 66 submissions I have to review for our upcoming Undergraduate Ethics Symposium. And then as soon as Cheryl got off the plane at 12:15 on Sunday, the sister fun commenced. First, a most tasty lunch at Cafe Patachou, right in the beautiful Indy airport. Then a drive up to Carmel to visit the Museum of Miniature Houses, which has also been on my must-see-before-I-leave-Indiana list. What's not to like about room after room filled with exquisite dollhouses with their adorable tiny rolling pins on tiny kitchen tables and tiny books in tiny bookcases? We each bough a teensy-weensy pencil holder complete with teensy-weensy pencil, scissors, and ruler, in the museum gift shop. The weather was rainy so we decided not to walk around Carmel's Arts and Design District, but instead drove next to the Indianapolis Museum of Art, situated in a hundred acres of gardens just north of downtown Indy. For a happy hour we wandered through their American impressionists rooms, cracking each other up with our hilarious commentary on the museum commentary printed on the signs next to the paintings (as well as loving the beauty of the art, of course). Then we checked into Cheryl's hotel and, now that the rain had stopped, walked for fifteen minutes or so to the hip, trendy dining options of Mass Ave and had supper together. So it turns out you can have a lot of fun in six or seven hours. Especially if your sister is there to have fun with you. Each Christmas Grandpa would give me a calendar with pictures painted by foot-and-mouth artists: disabled individuals who had lost the use of their hands, but were able to paint lovely scenes by holding the paintbrush either between their toes or their teeth. Each month also featured an inspirational quotation from somebody-or-other. Here is the only one I remember: "Be intent on the perfection of the present day." For years this was my mantra, and then for a while I forgot about it, but now I've brought it back for my final semester here at DePauw. "Be intent on the perfection of the present day." It's more than just a reminder to focus on the present rather than regretting the past or dreading the future. It's a call to make that present as beautiful in simple, easy ways as one can. I need to read papers submitted for an award I'm judging for best undergraduate children's literature essay, but I can read them by the Prindle fireplace. I need to get some exercise mid-day, but I can get it by walking the invigorating rim trail at the quarry, alert to the austere charms of a wintry landscape. I need to eat lunch: maybe I should treat myself to a $3.99 tuna melt sandwich at Treasures on the Square, which then became the Downtown Deli, and has now been rechristened the Downtown Cafe - but through all the changes the tuna melt has remained the same, so soft and warm and comforting. I have a lot of work to do, and I have my fair share of sorrows that are stressing me right now. But I can still fill my day with warmth and comfort. I can still be intent on its perfection. My dizzying, dazzling week in Olathe, Kansas, culminated in my being sent, after my return to Indiana, some photos from the cake-decorating contest that the Pleasant Ridge Elementary School held as the grand finale for the Families Read Every Day (F.R.E.D.) program that featured my book Mason Dixon: Pet Disasters. Here are some of my favorites of the entries. And a nice celebration of the book in cupcake form (you'll have to turn your head to see this one, as I don't know how to rotate it). It's February first, bitter cold outside, driven sleet frozen onto my car, heaps and heaps and heaps of work to do: reading Honor Scholar submissions, reading Undergraduate Ethics Symposium submissions (last year I read close to 80 ten-page papers as the judge charged with reading all of them to provide some uniformity in standards), teaching a senior-level class I haven't taught before (a single-philosopher class on the philosopher John Rawls), helping to organize a major symposium on global climate change, editing the papers that are coming in for the collection I'm assembling on ethics and children's literature, writing the Lois Lenski Lecture on children's literature that I've been invited to deliver at Illinois State University early next month. It's definitely time to start a new, more productive life, as is my practice on the first day of each month. The February new life has to have a LOT of work in it, and work for my job, not my own creative writing. But I think I can easily get it all done if I only pledge to put in a good hour at home early each morning before heading off to work either at my office out at the Prindle or my office on campus (for my teaching days). All I need to do is work at my desk from 6-7 and I will get it all done. But the trick is actually doing it. Today I worked for an hour on my Lenski lecture, and I have a plan for it that I like. Tomorrow I'll send off comments on the first of the ethics and children's literature papers for the collection; I've already read the paper and decided what to say, so it won't take too long to do the work of saying it. Sunday? Probably another installment on the lecture. Later in the day each day, when I don't need to be so fresh, I'll read Honor Scholar submissions, read for class, read books that I'm reviewing. Of course there has to be fun this month, too. And there will be. My sister is coming next weekend; the weekend after that I'll be back in Colorado for Gregory's junior recital; the weekend after that I'll be in New Orleans for the Central Division of the APA (American Philosophical Association), where I'm giving comments on a paper entitled "Are children persons?" (short answer: yes). I will drink hot chocolate, and eat oatmeal with brown sugar and raisins, as well as baked sweet potatoes at Chief's. I'll hang out in the evenings with my new housemate, political science professor Maryann. Here's to a new life for February!